Truman and his wife Ortentia traveled to the Salt Lake Valley with the William Snow/Joseph Young Company in 1850. They left at Winter Quarters the graves of two infant sons: Ezra Newton and Truman Milton. In 1852, Truman traveled west on a mission to India. He traveled to Los Angeles and then on the San Francisco where he boarded the ship “Monsoon” and sailed for Calcutta, India. At the end of his mission in India, he traveled to Liverpool, and boarded the ship “Enock Train” on 22 March 1856, and arrived in Boston on 1 May. From Boston, he made his way to Iowa City, where he joined the Daniel D. McArthur Company in 1856. His death date is confirmed by his burial records and Find a Grave web site. Crandal, Mary B. "Autobiography of a Noble Woman," Young Woman's Journal, Feb. 1895, 266-67; ibid., Apr. 1895, 320-23; ibid., May 1895, 387-88; ibid., June 1895, 427. Daniel Duncan McArthur Emigrating Company, Journal, 1856 May-Sep.
"Emigrants for Utah," Deseret News, 6 August 1856, 8. Leonard, Truman, Jr., Autobiographical sketch, in Biographical sketches 1891- , reel 27, box 27, fd. 10, item 8. McArthur, Daniel D. Reminiscences, in Journal History of The Church of Jesus Christ of Latter-day Saints, 26 Sep. 1856, 3-6. 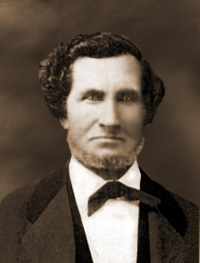 "Truman Leonard: Pioneer Mormon Farmer," Utah Historical Quarterly, vol. 44 (Summer 1976), 245. Woodward, W., to Albert Jones, Handcart Veterans Association, 12 Sep. 1906. Handcart Veterans Association, Scrapbook, 1906-1914, fd. 2.